I began searching for the perfect urn for my mother’s ashes even before she took her last breath. That may seem morbid, but putting energy into creating a memorial that would honor her life gave me something positive to embrace during those final dark days. I scoured the Internet yet nothing was jumping out at me as ideal for Mom. I thought about getting the same urn that I had gotten for my father. It rotates and allows you to add multiple photos. I have received great comfort from the urn, which I filled with photos from Dad’s young bachelor days to the end of his life. Katie Patton is the artist that operates Blocks from the Heart. She offers memorials in a variety of formats, from blocks to memory poles and ornaments. She makes memorials for both humans and pets. She is great to work with, very responsive and determined to create a work of art worthy of your loved one. I chose a keepsake box. I loved the idea of having 5 sides (including the top) to create a tribute to my mother’s life. It also was a challenge; how do you sum up your mother’s life in 5 ways? On the top of box, Katie merged a glamour shot of my mother as a young woman with a poem that my mother had chosen before her death as a way to remember her. Then I paid homage to her being an animal lover with a childhood photo holding the beloved family dog, her Navy career, her glamorous side and finally, being a loving mother. 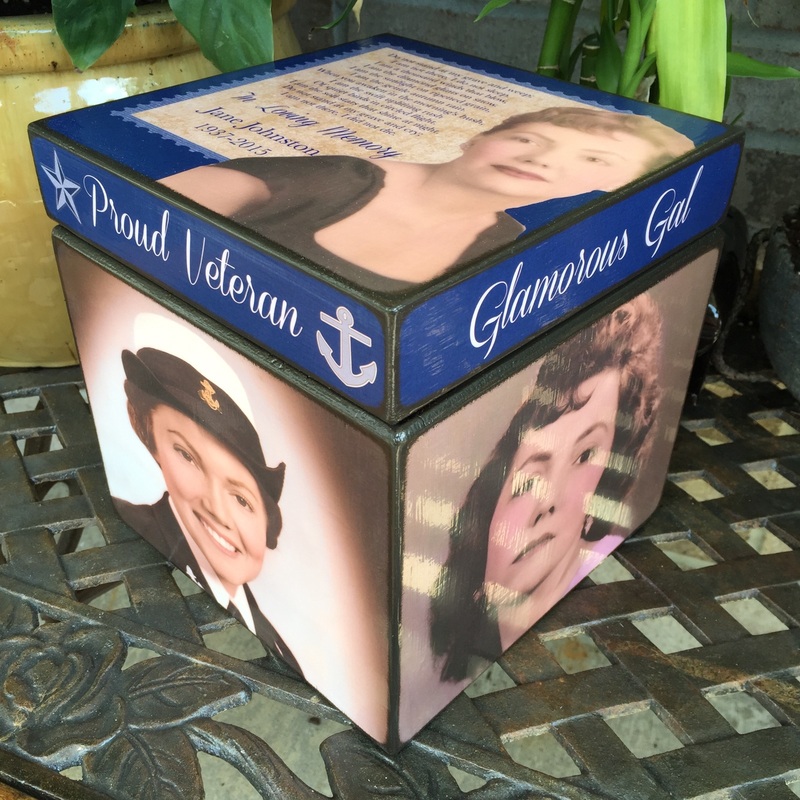 More images of my mom’s keepsake box can be seen on Facebook. The results were amazing. I love the box and my only regret is that I didn’t create it while Mom was alive. I think she would have been thrilled and touched!